🎯 You can change the layout: Guide, Guide Left, Minimal or none. 🎯 Change the text shown on the screen, its color and the section color. Appropriate for branding, showing stock images or company logos. The image should have a resolution of 1920x1080 pixels and cannot exceed 2MB. ☝️ The "Guide left" layout takes up 1/4 of the screen. Show company KPI metrics, meeting room agendas, slideshows, presentations, and much more. Websites that require a login are not yet supported, due to lack of ways to provide input. 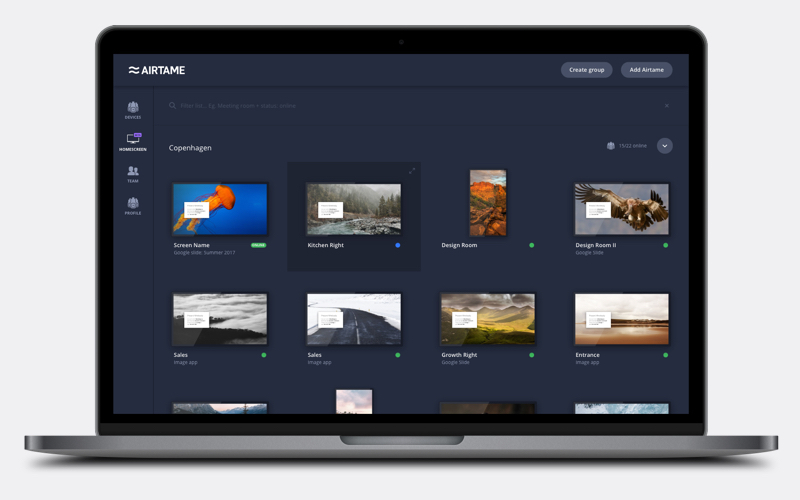 Airtame's homescreen can have four different overlays depending on the purpose of the screen. You can fully edit Guide left and Guide by changing the text, color, and transparency of the different overlay layouts. Guide left: By default, this layout will show a 3-step guide to help new users get streaming with Airtame. Guide: Here, you can see the same information as in Guide Left, however, in a more concise manner. 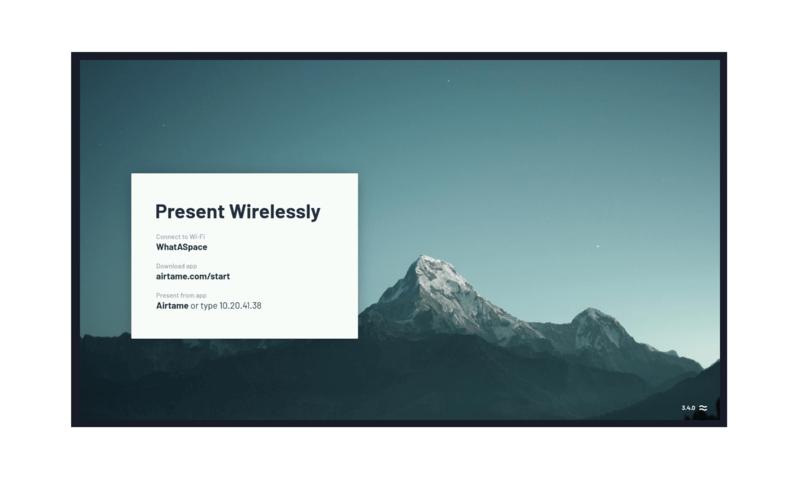 Minimal: This layout will show the name of your Airtame device and its IP address. None: No layout is shown on the screen. You can fully customize the text shown on the homescreen. This can be useful for adding your organization name, show relevant network information, have a tailored welcome message, and many more things. You can find a comprehensive guide on how to do so, as well as some examples you can copy here. Set orientation of your Homescreen to landscape or portrait mode. This options is only possibly through Airtame Cloud. This way device will not be visible in the application and will only be discoverable if you type in its IP address. 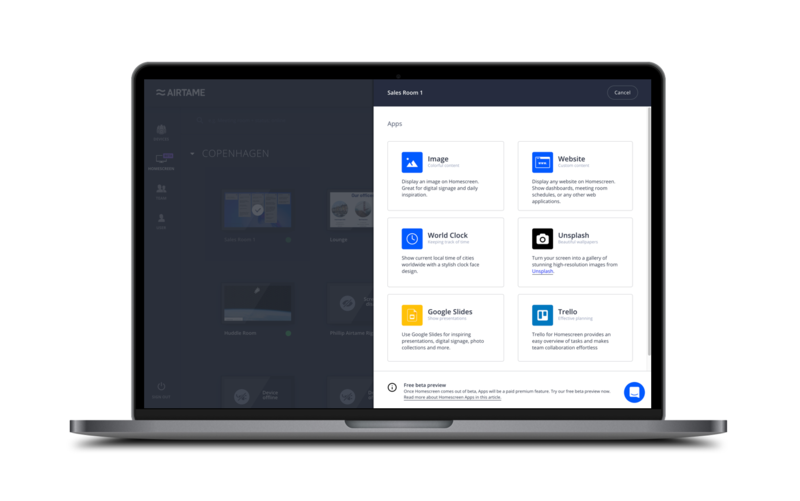 Use Airtame Cloud to easily integrate Airtame with applications such as Website, World Clock, Google Slides, Trello, and Unsplash. Learn more here.